LIVINGSTON, Mont. 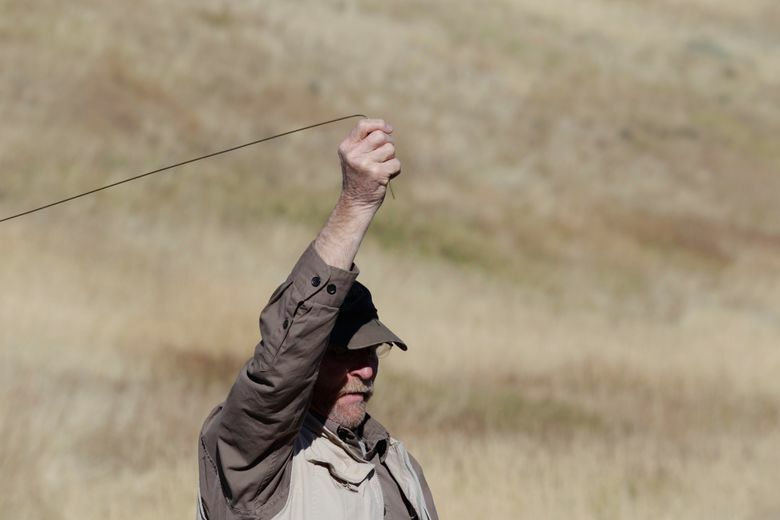 (AP) — Perhaps you’ve heard of water dowsing — the practice of using sticks or metal rods or other everyday objects to locate underground water. But have you ever heard of dowsing for unmarked graves? Members of the Park County Cemetery Board and Park County Coroner Al Jenkins went out late September to locate unmarked graves in the vicinity of the former Park County Poor Farm, which was located on Chicken Creek Lane east of Livingston. The Poor Farm operated from 1896 to 1922, Cemetery Board member Carol Woodley said, and buried its dead in unmarked graves. Poorhouses took in poor and homeless people in the days before Social Security, she explained. The grave dowsing came about because Jenkins had been to a nearby fenced area where unmarked graves were known to be. Jenkins was searching for a spot to lay to rest the cremated remains — which have come to be called “cremains” — of 19 individuals in the possession of the Coroner’s Office. Their remains were never claimed by relatives, Jenkins said, and have never been buried. He said he wanted to have the cremains properly buried, and he had hoped to place them outside the bounds of the enclosed area near a corner. He decided to dowse for existing graves before digging, he said. He dowsed the area and found several spots he identified as unmarked graves. 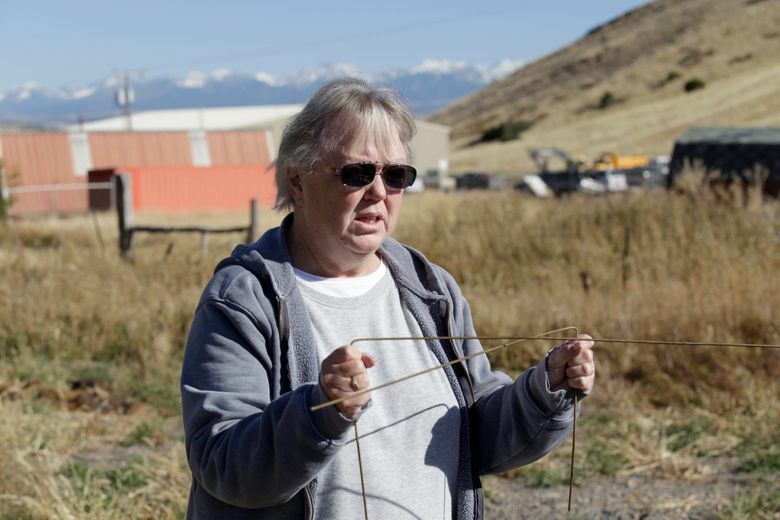 On a recent Friday morning, holding a metal, L-shaped brass brazing rod in each hand, Jenkins and other Cemetery Board members Audrey Dodge and Diane Kiger walked slowly over a piece of ground near the gravesite enclosure. When they were standing over a grave, they explained, the metal rods, held by the short end of the “L,” would move and cross over one another. Then, by holding one rod overhead with the long end parallel to the ground, the rod would spin slowly in either a clockwise or counterclockwise direction. Clockwise indicates the remains are of a man, and counterclockwise means a woman, Jenkins explained. Woodley, who said she’s not “good” at grave dowsing, held a clipboard and kept a tally as Jenkins and Dodge identified grave sites and then the gender of the deceased. Woodley tallied 10 deceased individuals in a field across a dirt road from the cemetery enclosure and at least two under the road. Jenkins had located 11 on the hillside above the enclosure. A paper published in the early 2000s by William E Whittaker, with the Iowa Office of the State Archaeologist, cited scientific studies done of dowsing for water, not graves. “Tests have ranged from real-world tests to tightly-controlled experiments with buried pipes or double-blind experiments in artificial settings,” he wrote. All of these tests, involving hundreds of dowsers, reveal that dowsing is no better at finding water than random chance. His paper catalogued a number of Iowa sites where grave dowsers indicated the presence of graves, but subsequent excavation did not uncover any remains. However, Jenkins said he discovered decades ago that he had the knack for grave dowsing. Jenkins doesn’t pretend to know how grave dowsing works. Jenkins said he plans to invite various clergy members to the burial of the 19 cremains, as well as family members he knows of. He has not yet determined the date the burial will be held. People who want to learn how to dowse can start out in established cemeteries, according to a webpage on the Ancestry.com website, which is devoted to genealogy records and research. Jenkins invited anyone who doubted dowsing to join him at Mountain View Cemetery. Woodley has made a mission of identifying those lying anonymous in their final resting places. She wrote a book a few years ago about the people interred at Old Chico Cemetery. She believes strongly that no one should lie in an unmarked grave. Do the deceased ever “talk” to Woodley? But if somebody wants to be found? “‘Now that you’ve found me, tell my story,'” Woodley said, as if speaking on their behalf.